Fifth grade is an exciting time for your children, made even more memorable with a yearbook commemorating your child’s last year at LCS! The 5th grade yearbook is now available for order. This year’s yearbook will be approximately 90 pages, hard cover and will have hundreds of photos documenting all 6 years at LCS with a concentrated focus on the 5th grade. Care will be taken to ensure that every child is in the yearbook numerous times so that all children can enjoy their LCS memories. Yearbook signing day will be generously hosted by 5th grade teachers at the end of the school year where all the 5th graders gather in the cafeteria to sign each other’s yearbooks. 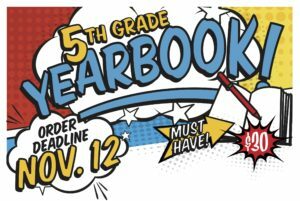 In order to guarantee a yearbook for your 5th grade child, you MUST ORDER by 11/12. The yearbook cost is $30.00. PAYPAL: There is a $0.98 PayPal fee per yearbook if you choose to pay via this method. CHECK: Check should be made payable to LCS PTO. Send in a sealed envelope to school “ATTN PTO: 5th Grade Yearbook/YOUR STUDENT’s NAME” Your check must be received no later than 11/12. YOU MUST STILL FILL OUT THE BELOW FORM. ORDERING MORE THAN ONE BOOK? You will need to submit a form for each student.